This is an educational and informative site, all about search engines, with links to other valuable resources of information. It will also be an in depth discussion about prominent search engines like, Google, Bing, Yahoo and other beneficial search engines. Search engines want to know.. This is not as easy as it sounds. Many searchers don't know what they are looking for and others don't know how to input their search query in a way that the search engine can process it. A good search engine takes the individual into consideration and pre-determines what they'd most likely be searching for. 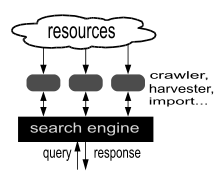 This can be influenced by the popularity of a website; 1) the search trends (what is mostly typed in as search queries during that period), 2) the authority of the websites and 3) your own personal preferences that the search engine automatically detects or through your input, in advanced search options for example. It is critical for a search engine to deliver a satisfactory result to the searcher and an awesome responsibility to do it fairly. The moment a search engine gives biased results it looses credibility and searchers will stop using it! Search engines search the web which is made up of over 30,000,000,000,000 web pages and is constantly growing. Check this link here to see how the Google search engine works explained in a simple way. Its a must read, what happens is really awesome! We are going to run articles on Google, Yahoo, and Bing. We will examine the their strong points and where they may fall short with regard to valuable search results. We will also look at how this affects business and how the search engines need to constantly be optimized and how webmasters should keep their own sites optimized for the best user experience. How can you use search engines effectively? The uses of search engines are endless and they are undeniably valuable to most economies in the world today. The fact is everyone is searching for something from birth and until the day they die. You can find information on almost every topic. There are a lot of resources on the world wide web, but unfortunately it can be difficult to find reliable information. That is where understanding the operation of various search engines can help us. A website can easily give the impression of candor and honesty, but that can mean very little. One of the roles of a quality search engine is to check the authority behind a site. If the publisher gets a reputation of producing fraudulent material, it will count against his work and vice versa, it will help material to be easily found that has been produced by a reliable author, someone that has been recommended by other reliable publishers. Currently, this is where a lot of emphasis is being placed in search engine optimization. Those who optimize websites for search engines have had to change their strategies dramatically in the last few years. SEO specialists are growing in number every day and the competition for them to rank their own websites is the toughest online. Search Engines, like Google, aim to help you find what you looking for. This is helpful and saves a lot of time for the searcher. So how do search engines actually work? For a more indepth view of how Google's search engine operates, go to this link, it tells the story well. The Search Engine needs to collect as much metadata as possible about items that may be searched for. This is referred to as 'indexing' and enables quick search results for the user when he searches. Some less popular internet search engines search in real time and do not use indexing but display search results as they are found. The user inputs a 'Search Query' which gives the criteria of the topic of interest. Usually these are textual inputs, but they can be sound or image. Sometimes search engines provides for a combination of input types. The presentation of the 'search results' in an order of relevance, based on probabilities of what you are searching for. Its similarity to your query, the popularity and authority decides the relevance of the items searched for. This is the function of the 'algorithms' that are implemented by the various search engines, and each search engine can apply it differently.